What goes into 10,000 hours of practice? Research has shown that it takes around 10 years of daily practice (2-3 hours a day) to reach the pinnacle of any discipline. It’s where the famous 10,000 hour rule comes from. It’s a rule so powerful it can make anyone a decent cricketer no matter how much natural talent they have (or lack). But while 10,000 hours is a nice headline, what’s not so clear is what you do during those hours. Because how you practice is as important as how much you practice. A feedback loop, if you will. A bit like the picture above. A simple example of this would be bowling taget practice. Here the practice is to set a target on the pitch and try to bowl in it. The instant feedback is whether you hit it or not. You can adjust and repeat as many times as you like and slowly watch your accuracy improve. What you may have noticed is how different this is from playing cricket. It may seem strange to say this, but that’s because playing matches is not a good way to improve. Playing simply tests your current abilities, but without an instant feedback loop and repetition you can’t improve. Consider the batsman who is weak against short bowling. In a game he may get none at all, or worse, get out early to a bouncer. He may have plenty of time in the pavilion to think about the adjustment, but with no way to repeat the ball he can’t learn. Nets are similar. Even the best run nets don’t give you the chance to adjust in controlled conditions. Bowlers are not going to give batsmen a leg stump half volley to practice the on drive repeatedly. It’s slightly easier for bowlers who can ignore the batsman and practice accuracy or pace, but often a batsman’s reaction (especially slogging) is highly distracting. 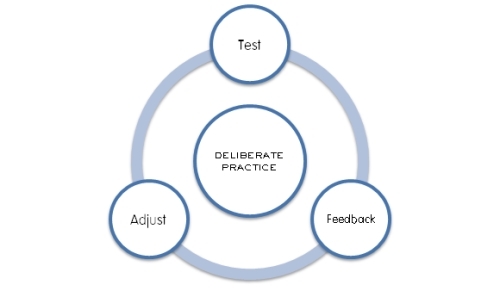 So keep games and non-feedback training out of your 10,000 hours and start racking up the feedback based practice.